The other week my little man made the big step of moving into his own nursery so I thought it was about time to share the space with you. 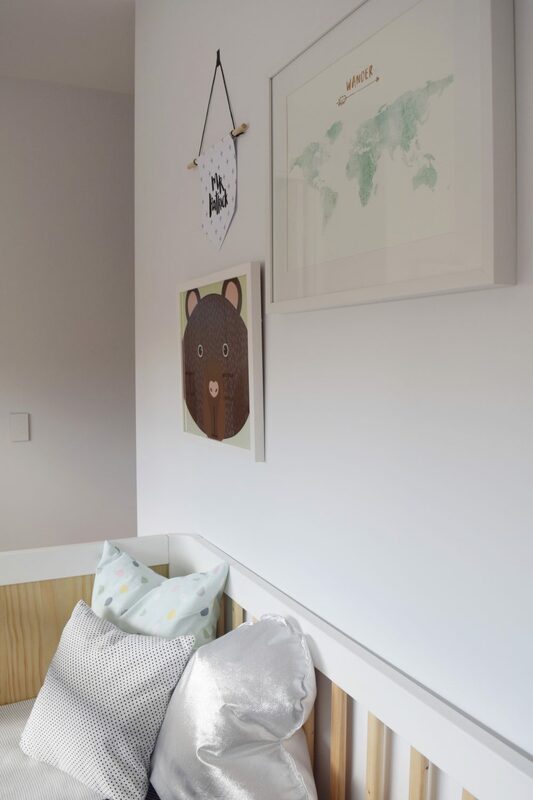 I wasn’t quite ready to move him into his own bedroom downstairs so instead, I converted the small landing space outside our bedroom (designed as a study nook) into a nursery. 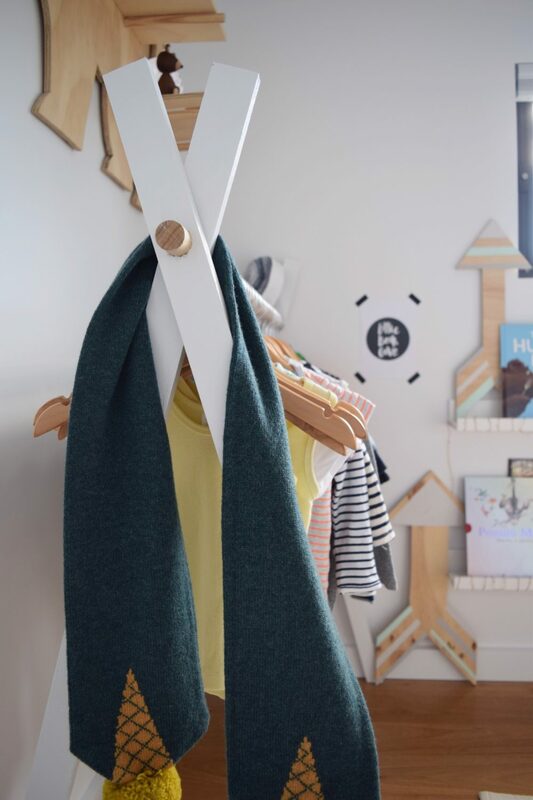 It’s a teeny tiny space that only just fits a cot, chair and clothing rack but I love how we’ve injected personality into the space with sweet buys from local makers and our own DIYs. 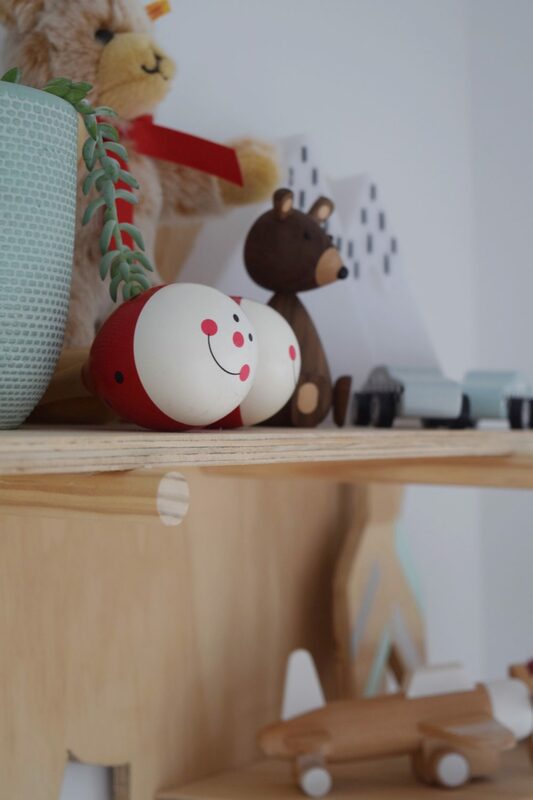 Here are photos of the space and my tips for setting up a tiny nursery. When you are working with a tiny space, it’s likely (no matter how hard you try!) you won’t fit all the pieces you want/need in there. Cot, change table, chair and clothing drawers/rack were all on my essentials list but given the awkward doorway I needed to keep clear at the back of the room, there was no way they were going to all fit. Now that Patrick is a bit bigger and sleeping (sort of) through the night, I decided to keep his change table in our bedroom so the other items would fit in here. Although there are only a few large pieces in this space, I tried many different configurations (such as cot where the chair is, cot where the clothing rack is, and finally cot where it’s pictured) before deciding on this layout. Sometimes the best configuration isn’t what you would expect so experiment and move the furniture about before you fill the space with smaller pieces and decor. And sometimes furniture can look best when it’s pulled away from the walls (if you have space to afford it) or on an angle. When you don’t have much space, the last thing you want to do is fill it with dark heavy furniture. Create the illusion of space by selecting lighter pieces or furniture with legs. When the furniture is raised off the ground, it allows your eye to see more of the floor which creates the illusion of space. I opted for light timber and white furniture in this space, it keeps it feeling light and airy. Too often we forget to maximise the vertical space in a room! 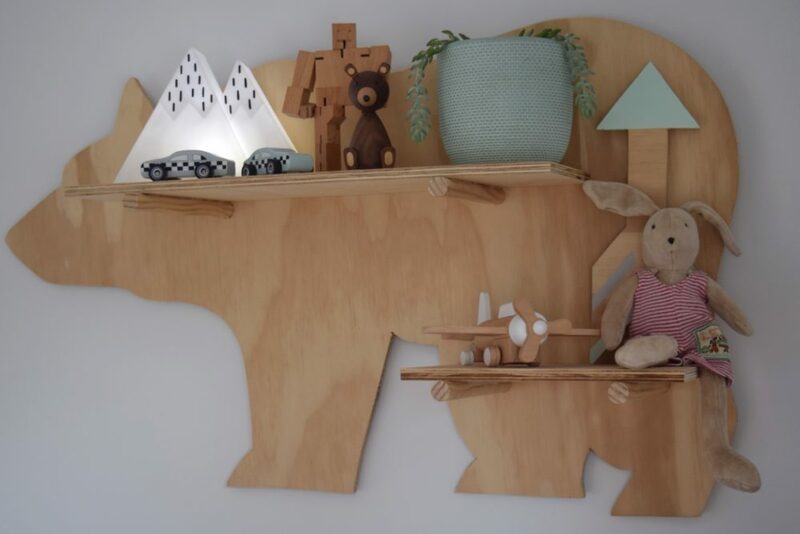 The bear shelf we made holds many of Patrick’s favourite toys and the two white book shelves display all of his books. Over by the chair are also some wall hooks, which are ideal for hats and other small pieces. Just like in any other room of the house, rugs are a great way to anchor the space or create the sense of zones. 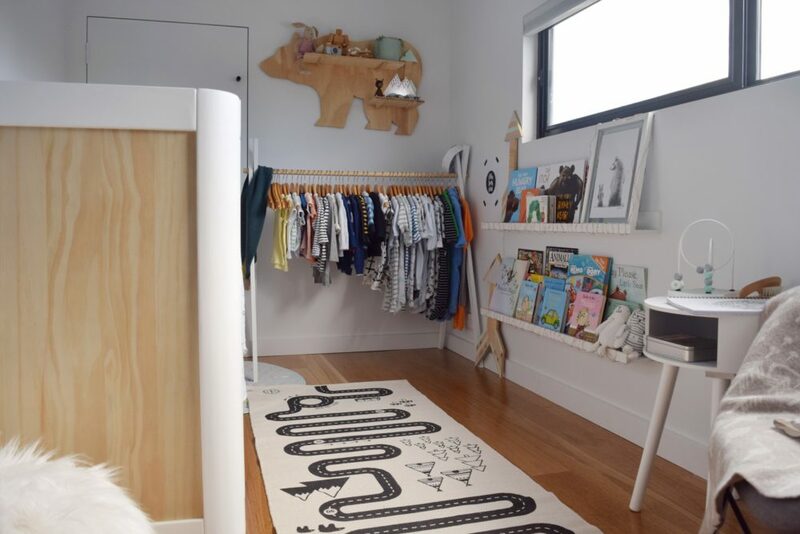 In Patrick’s nursery, I wanted to create a ‘play zone’ below the half-height door at the back of the room. I used a small round rug to achieve this with several baskets of toys. The rectangular race track rug emphasises the length of the room, helping the space to feel larger. Wall art draws the eye upwards and around the room. 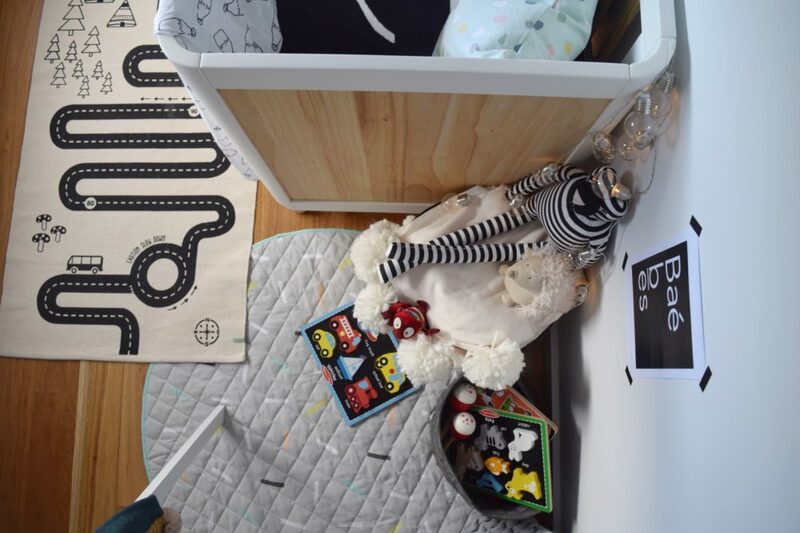 I created a cluster of pieces above his cot — Shenton & Thrello ‘Mr Patrick’ name banner, bear illustration and Emma Kate & Co ‘Wander’ map — as well as above the chair and near the clothing rack. 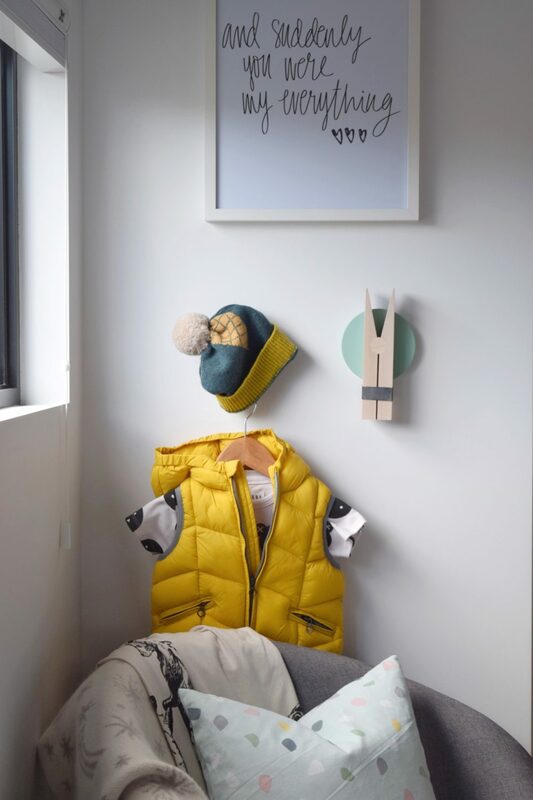 There is such a wide range of nursery wall art options available now and I find Instagram is a great place to search for independent artists and designers. Also, don’t feel that wall art always needs to be in a frame or behind glass. 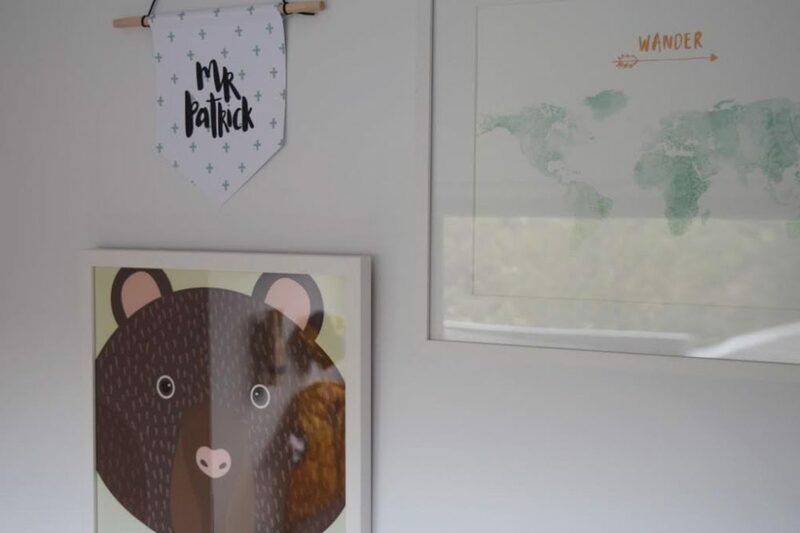 The name banner I’ve used, those ‘Sleepy Eyes’, wire words, bunting, or even stuffed animal heads are just some examples of different types of wall art you could use. It never crossed my mind. 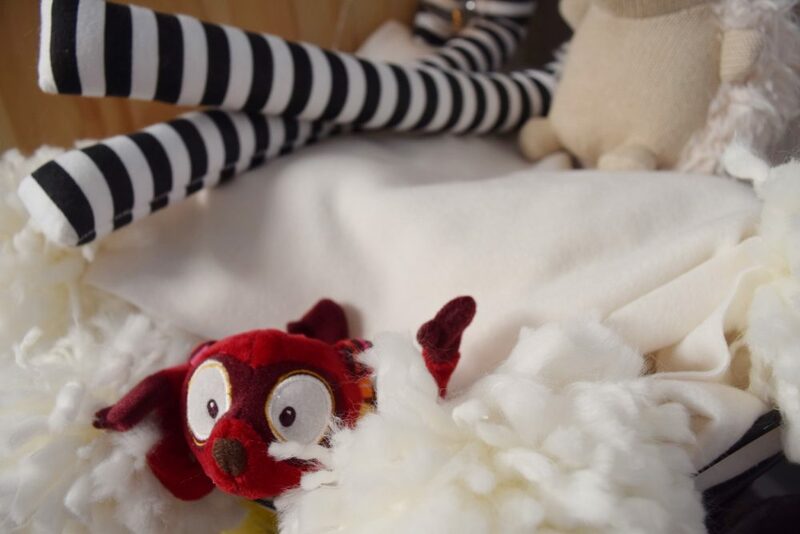 Is it really hard for kids to sleep in a room that is so interesting and fun? It does make sense. We always read about how bad it is to work on a desk in a bedroom, since mind can’t easily shift from work mode to sleep mode, and changing ambiance can help us to sleep better. Maybe a bedroom/nursery shouldn’t also be a playroom. 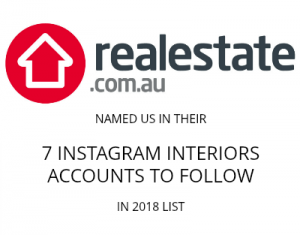 This could be so helpful for our clients. And for parents. 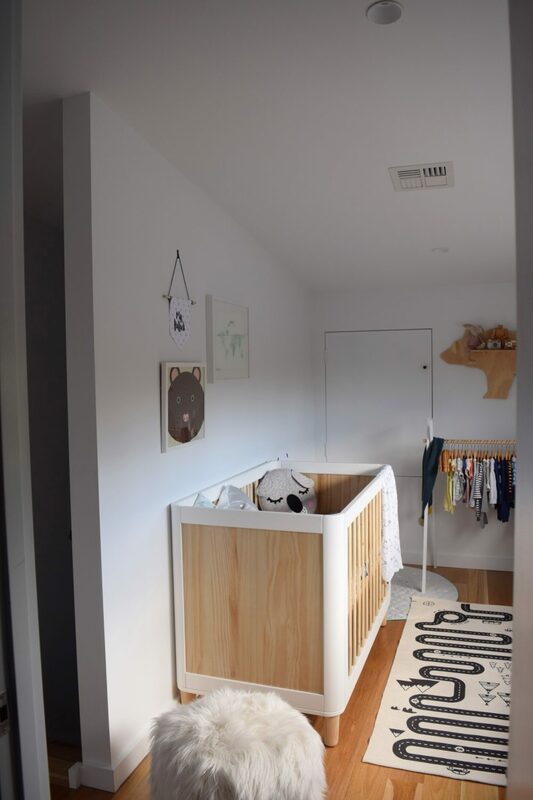 I’m so glad I read your comments, but I also wanted to say how much I love the idea of using the more practical space for the nursery, even though it may not be an ideal one. And I’m sure it’s amazing even without the decor. Thanks Michelle, it’s a bit weird to look at these pics now because his nursery is temporarily just a white room with a cot and chair 🙁 He was waking in the night and getting way too stimulated by all the books and art in the space that he would then want to play at like 2am! So I stripped everything out of this room and he now sleeps through the night. I’m about to create his ‘real’ nursery downstairs so wish me luck that he can handle all the decor that will be coming his way lol! Good effort making the most of a small space! I’m a big fan of that kind of low wall mount shelving to store books. 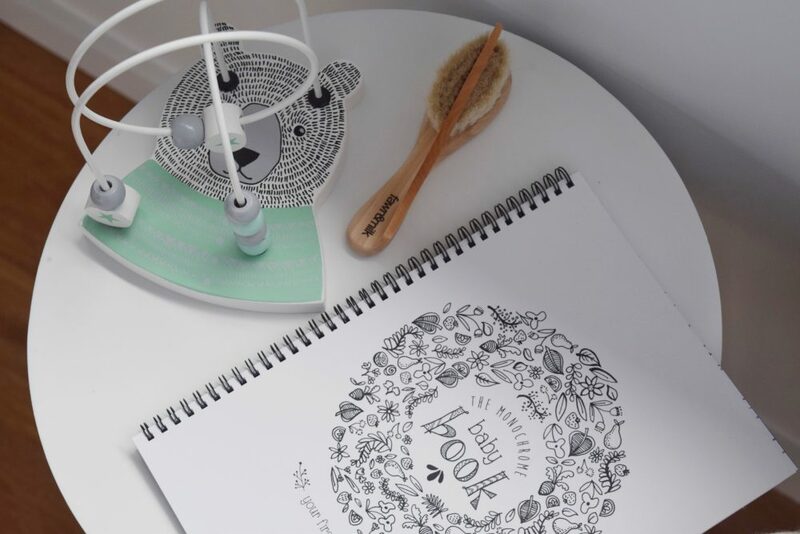 The best thing is you’ll get to do plan something new when he moves into his ‘big boy’ room! ? Thanks Jane 🙂 I’m really looking forward to doing his next room where there’ll be more space to work with. I like the idea of a small table for him with cute chairs where he can do colouring in and some sort of tent or cubby would be sweet too.